Clinton, Comey, Uranium One: Who Is John W. Huber? Widespread head-scratching has followed Attorney General Jeff Sessions’ recent disclosure that U.S. Attorney John W. Huber is leading an investigation into 2016 election controversies. In a March 29 letter to Republican committee chairmen, Mr. Sessions said that Mr. Huber, the U. S. Attorney for Utah, had been appointed to “evaluate certain issues” raised by the GOP. He did not say which issues, but there are plenty. In a July 27, 2017 letter, GOP leaders had called on Mr. Sessions to “appoint a second special counsel to investigate a plethora of matters connected to the 2016 election and its aftermath.” These included actions by Hillary Clinton, James Comey, Loretta Lynch and others, email controversies, mishandling of classified information, Fusion GPS and the Steele Dossier, FISA warrants, wire taps, leaks, grand juries, the Clinton Foundation and the Uranium One deal. Translation: Mr. Huber is investigating the investigations, not the underlying allegations. Mr. Huber was appointed Assistant U.S. Attorney in Utah in 2002. He was named U.S. Attorney in 2015 by Barack Obama. Mr. Huber has an important backer in Utah’s senior senator, Orrin Hatch. After President Trump requested the resignations of all sitting U.S. Attorneys, Mr. Sessions kept Mr. Huber alive with an interim appointment under the Federal Vacancies Act, until the president could be persuaded to re-nominate him. He was confirmed a second time for the post in August. It’s a truism of law enforcement that if you want to pursue high-level political corruption, get yourself a junkyard dog - a strong prosecutor, good in a fight. Hickman Ewing Jr. - the former U.S. Attorney for the Western District of Tennessee and later the Whitewater Deputy Independent Counsel - comes to mind. Mr. Ewing had a long track record of pursuing political corruption before Kenneth Starr tapped him for the Whitewater probe. The Office of U.S. Attorney in Utah, by contrast, has been toothless. Mr. Huber has not been implicated in any wrongdoing, but for the last three years it has been his shop and his responsibility. Before that, it was his training ground. In November, for example, a federal judge dismissed the last charges against Terry Diehl, a powerful Utah developer and former Utah Transit Authority board member. The government was widely seen as bungling the case. The Salt Lake Tribune noted that Diehl, “a well-known developer with friends in high places — including [Utah] House Speaker Greg Hughes, R-Draper — once stood charged with 14 felony counts that stemmed from allegations that he lied about or hid assets as part of a 2012 bankruptcy. Prosecutors had whittled the case down three times since early October, dropping counts of concealment and tax evasion.” Prosecutors acknowledged “missteps” to the newspaper, including getting wrong the amount of taxes Diehl allegedly did not pay. Mr. Huber’s office also lost a 2017 case against real-estate mogul Rick Koerber, charged with running a multi-million-dollar Ponzi scheme. The case - the government’s second try - ended in a mistrial. A judge threw out an earlier case. The government will try again in September. But the Rosetta Stone for understanding Utah’s corruption problems may be the sprawling saga of John Swallow and Mark Shurtleff, two former Utah attorneys general charged with a multitude of corruption charges. The case gripped the state for years. Mr. Huber’s office recused itself in 2013 from the investigations, transferring the case to Colorado. Later, the Justice Department declined to charge either man and Utah state prosecutors took over. Swallow was acquitted on all counts last year and the charges against Shurtleff were dropped in 2016 by Davis County Attorney Troy Rawlings, who bitterly complained about FBI and Justice Department conduct in the case. That’s how the game is played in Utah, locals say. Power brokers have the state wired. Mr. Huber seems like a decent man, but his tenure at the top of Utah law enforcement has been short and undistinguished. Why appoint him to such a sensitive position in Washington? One explanation is that Mr. 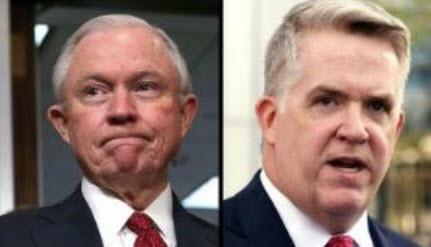 Sessions knows precisely who Mr. Huber is and what he wants from him. Mr. Sessions went to bat for Mr. Huber in his re-appointment as U.S. Attorney and named him vice-chair of the prestigious Attorney General’s Advisory Committee. Mr. Huber, a political survivor, knows precisely who Mr. Sessions is and what the attorney general wants from him. Uranium One’s assets included significant holdings in Utah and nearby states. Prosecutors - and the media, so transfixed by the Mueller probe that they decline to look elsewhere - should follow the Uranium One money in Utah and the rest of the West. And if Mr. Huber does recommend additional investigations or a second special counsel, Mr. Sessions should get himself a junkyard dog.